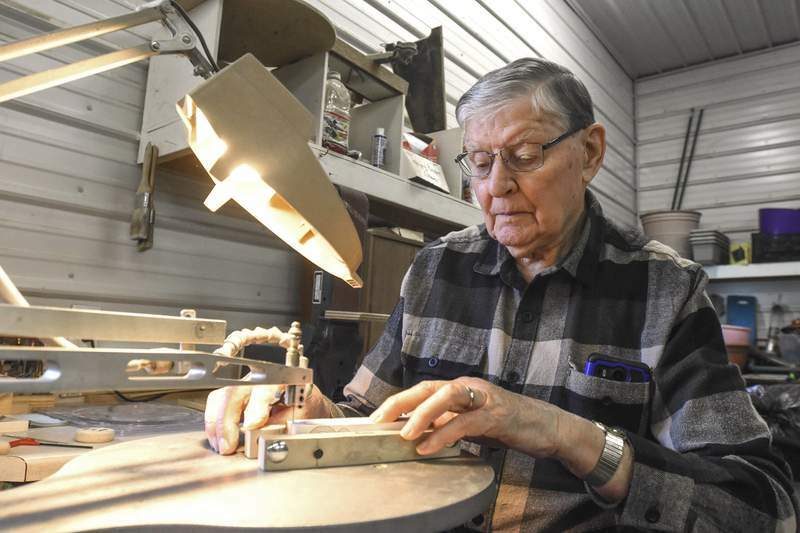 Photos by Michelle Davies | The Journal Gazette Jim Johnson, 89, uses a scroll saw in The Cedars garage to make his wooden ornaments, which he sells or gives to staff. Creating the ornaments on the scroll saw requires good hand-eye coordination. Despite having cataract surgery, Johnson is still able create the intricate ornaments. 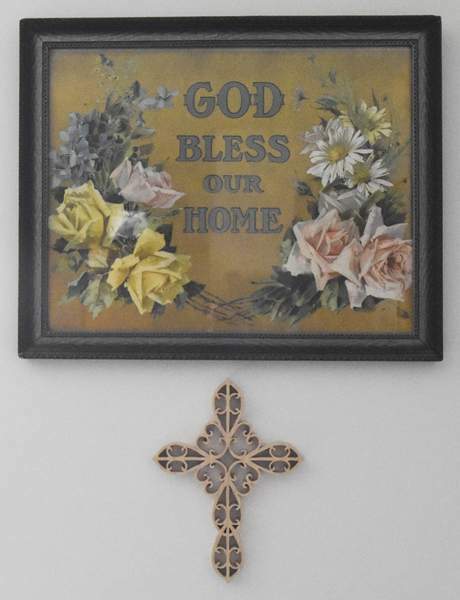 Michelle Davies | The Journal Gazette An ornate cross that Jim Johnson cut out with a scroll saw hangs below a piece of art that he collected with his wife. This once-a-month feature profiles of northeast Indiana residents who are age 70 and older. If you would like to submit a senior for possible publication, email Terri Richardson at trich@jg.net. Jim Johnson has always been good with his hands. It may come from years of being a tool and die maker, but the 89-year-old has always been handy with tools, he says. Even as a pre-teen he helped build things, recalling the time he and his father built a rowboat in the basement of their home. Sitting in his room at The Cedars in Leo-Cedarville, Johnson holds up an ornament and looks at it proudly. He points out the intricate details of the ornament. The wooden shape appears delicate with its ornate cuts and tan color. Johnson makes them using a scroll saw in the garage of The Cedars, a senior living community. It looks like something a person might pay a large price for at a store, but Johnson sells them for much less than one might guess. “I give away as much as I do selling them,” Johnson laughs, often using them to barter for such things as haircuts or giving them as gifts to the staff. He has actually made 570 ornaments, each being crafted from a single block of wood. He makes 12 different designs, each one as beautiful as the next. Johnson also makes ornate crosses and collapsible baskets. But what he does the most are ornaments. Johnson talks about the years he spent working in machine shops in Ohio, Michigan and Ossian. And while he has worked years building physical things for people, he also worked years building the spiritual side of people. Johnson has spent 65 years in ministry – seven years as the pastor of Grabill Missionary Church. He became a full-time pastor at Grabill Missionary in 1960. He was 31 years old, about the same age as Jesus when he started his ministry. Johnson sees himself as a carpenter – just as Jesus was – using his hands and heart to help others. Johnson uses a rolling walker when taking visitors to the garage where he makes his ornaments. There is a covered walk to get to the space and Johnson says the floors are heated, which makes it nice to work in the winter. The garage has many tools available to residents who want to use them, including other saws and a sander. Johnson walks over to the scroll saw and sits down. He pulls out a box from underneath a shelf that is full of precut wood with different designs attached to them. 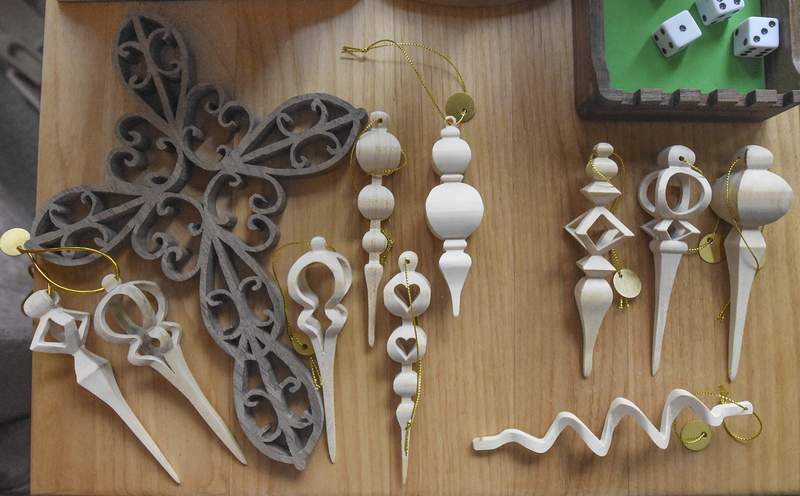 It takes about an hour to an hour and a half to make an ornament and about eight hours to make a cross, Johnson says. He can make about six in a day. He uses poplar, basswood and walnut for his work. His favorite wood is basswood. 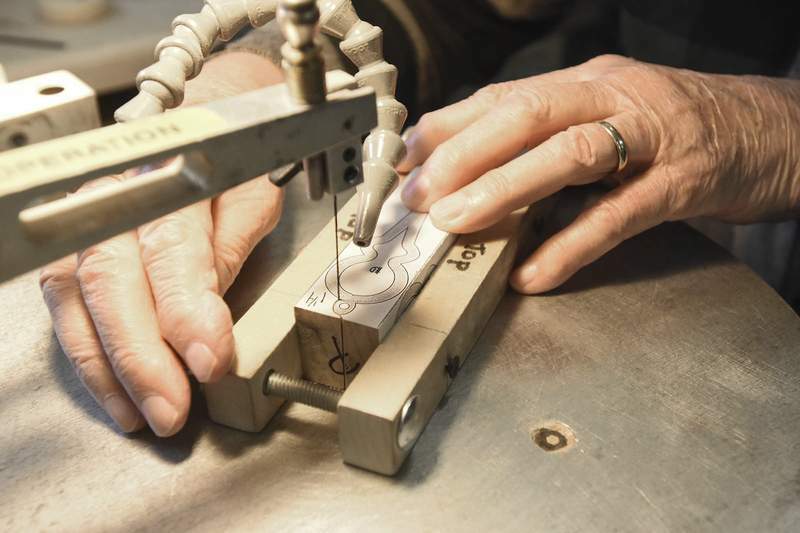 It is delicate work as Johnson has to guide the saw's small blade around the pattern placed on the precut wood. One slip and the ornament can be ruined. It takes great hand-eye coordination to do the ornaments, Johnson says, which makes it even more daunting when Johnson reveals he's had cataract surgeries in his eyes. “I wonder when that's going to leave,” Johnson says of his ability to make out the details. Most people hear about Johnson's ornaments by word of mouth or through his children. He has a list of what states his ornaments are in. They include 13 plus Africa. Johnson talks about his years of pastoring, which included Carolyn, his wife of 65 years. She passed away in 2015. The couple had five boys and a girl and 16 grandchildren. He talks lovingly and proudly of his wife, who he says started the children's ministry program at Grabill Missionary. Before that, “they didn't have one,” Johnson says. “I don't know what I would've done without her wisdom,” says Johnson, adding that Carolyn was always praying for him. Johnson enjoys staying busy. He says he likes to visit with other residents at The Cedars and has pretty much given everyone on staff there an ornament. They say hello to him as he walks down the hallway. Johnson knows all their names and says each one as he greets them. Johnson also likes to color. He has adult coloring books and pages and 150 different colored pencils to choose from. He is part of the ROMEO club – Really Old Men Eating Out. They meet twice a month at local restaurants. There are 50 men involved but an average of 20 show up to eat and converse, he says. “I never thought about growing old,” says Johnson, who adds he will be 90 in March. But his age is only a brief topic as he shifts back to talking about his ornaments and how he is planning on getting additional wood to make more.